ExamXML is a powerful and easy to use a visual XML differencing tool for Windows 95/98/Me/NT/2000/XP/2003. It was specially developed for comparing and merging XML files in an intelligent manner. It provides best-in-class features that distinguish ExamXML from other XML differencing tools. 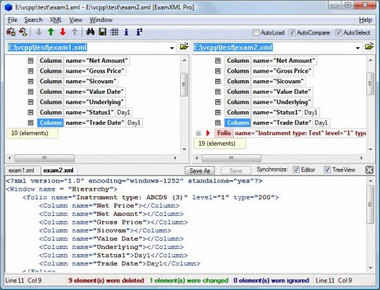 Unique to ExamXML is its ability to ignore elements that match users’ defined condition. In addition to the usual textual comparison, ExamXML adds ability to compare numbers in numeric format and dates in date/time formats.